Crossing the street, on my way home from a run, I found myself at the intersection of Old News and News Road. I really noticed the street signs and was jolted. What is at the intersection of old news and news? The present moment. All that is. Like Eckhart Tolle’s book, The Power of NOW. I run this route and pass this corner at least twice a week. And NEVER paid attention to the signs. I was always moving and going somewhere. I had a street to cross. And so I missed some important guidance. Thinking back, how many times have you missed important signs? Look at those signs. Old News Rd crossing News Rd. Laugh out loud. Yes, Lord, I am here. Present and accounted for. What do I need to pay attention to and what should I do next? I go a few more steps and look back and I see the big old STOP sign. I get it. I get it. Stop judging, stop envying. Stop worrying, and oh yeah, stop trying so hard. You don’t hear this in your day-to-day life. Usually it’s go harder, faster, stronger! Today I received the message to stop trying. Surrender and release. Balance ease and effort so that when you’re trying too hard, you know when to back off, and when you are slacking, you rev it up. Only the loving Universe tells you to slow down and rest. At this point, I knew who I was talking to. I soak it all in, totally amazed at how obvious the signs are and what they are communicating to me. Then I’m like, “Ok, I’m going to be still.” I stand there and take a pic because I just can’t believe the magic that’s happening at the intersection of Old News and News. 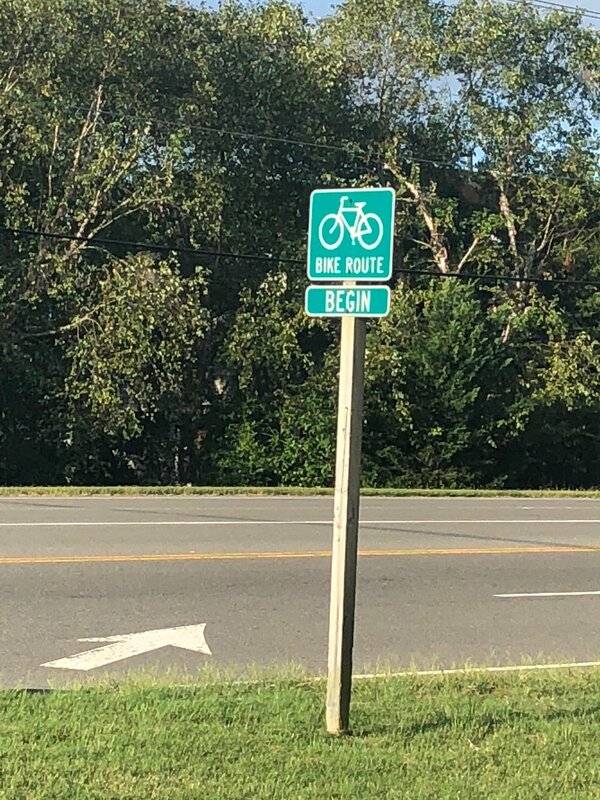 I look to the right and see there is another sign which is the beginning of a Bike Route. There was also an arrow on the road directing traffic to move over to make room for a brand new lane. MESSAGE!! That’s what is happening to me. Rest awhile, then create a new lane and ride with it. Ride and Flow. This was my overwhelming moment to understand that coincidences are not random. They are the Universe speaking to you for a particular reason, and at that particular time. Coincidences, synchro-destiny, omens or whatever you call it are signs. Consider each sign is a sentence. And when you string them together, you create paragraphs about what direction to take. And when you become really aware, you stay in constant contact by using your own personal GPS system that lifts you up and encourages you in all of your endeavors. I’m still a baby learning a new language. Each sign offers maybe a word or a phrase of an AHA! moment. Often I have to be hit over the head by a translator to figure things out. But after the meeting at the intersection of Old News and News, I’m going to practice all the time. I’m going to deepen my study. The answers are all here. I only have to do one real thing….